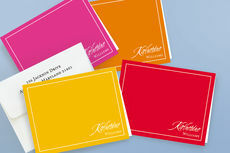 Hot colors for all your hot news with this set of correspondence cards. 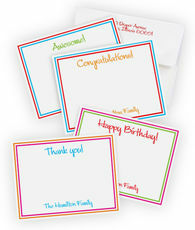 Each set is an assortment of 24 flat note cards with blank envelopes, 4 each of the 6 different colorways. 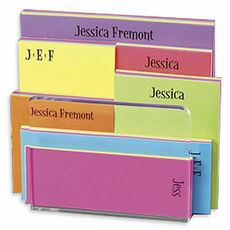 Half the order is personalized at the top, the balance is personalized on the bottom. Size of note card is 5.5" x 4.25". Flat printed in ink color and typestyle as shown. Positioning as shown. Printed return address available in flat printed black ink.